This ad spot is from the German chemical company BASF (Badische Anilin- und Soda-Fabrik or “Baden Aniline and Soda Factory”). I made this tongue-in-cheek guide for my wife’s amusement. When I was a new fan of the British science fiction television show Doctor Who, I had a lot of trouble keeping straight all of the incarnations of the Doctor. This was because the Doctor had the annoying habit of regenerating into a different actor every so often as the series progressed over the course of 50 years. So I started giving each one of the incarnations a nickname just for my own personal use. 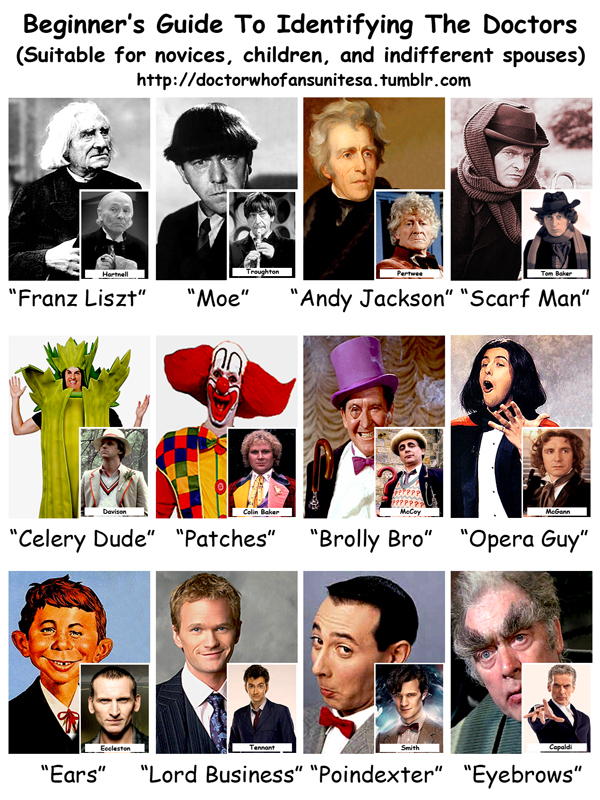 She has been bugging me to make an image guide listing all of my nicknames for her Doctor Who Fans Unite fan club, so here it is. Feel free to copy it and share it. My fan-made guide is under a Creative Commons by-nc-sa 3.0 license, so feel free to copy, modify, and share it so long as you give credit and it’s not for commercial gain. After all, I do not own the images and I am using them for fun as a fan. Whether you are a fan of the older series or of the new, check out the Doctor Who Fans Unite meetup if you want to be a part of a local group who love the Doctor in all of his various forms. Today marks the 50th anniversary of the British science fiction television show Doctor Who. The show was first broadcast on BBC1 at 5:16 PM GMT on Saturday, November 23, 1963. The show ran for 26 seasons on BBC1 until it was suspended in 1989. In 1996, a single television movie was broadcast on the Fox Network. In 2005, Doctor Who finally returned and is currently being broadcast once more on BBC television as a direct continuation of the 1963–1989 series and the 1996 television movie. This makes it the longest running science fiction televison series. The BBC is celebrating the 50th anniversary by broadcasting simultaneously in 94 countries The Day Of The Doctor, a special episode written by Steven Moffat. 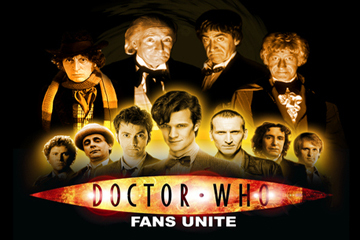 Whether you are a fan of the older series or of the new, check out Doctor Who Fans Unite if you want to be a part of a local group who love the Doctor in all of his various forms. 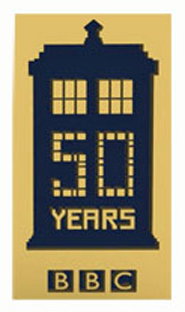 While you are at it, download and build your very own paper TARDIS and join in on the celebration!